GPHC health officials in the company of the transplant patients and their donors yesterday. The Georgetown Public Hospital Corporation [GPHC] recently undertook an historic feat when it conducted its first bout of paired exchange kidney transplant surgeries. 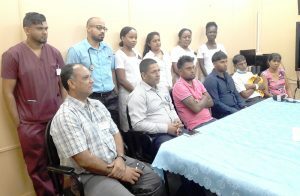 Those operated on were 30-year-old Ravi Narine of Enmore, East Coast Demerara, who was awaiting a transplant for two and a half years, and 58-year-old Freddie Budhoo of Berbice, who was in waiting since last year. The two, as well as their donors, are recovering well, according to Kidney Transplant Surgeon attached to the GPHC, Dr. Kishore Persaud, who spoke extensively of the procedures yesterday during a press conference. The surgeries were conducted last week and each spanned a period of about eight hours. All patients will be eligible for lifetime follow-up attention at the GPHC. Dr. Persaud, the lone Kidney Transplant Surgeon at the GPHC, was supported by a team of doctors and nurses who helped to care the patients throughout the surgical procedures. The move to adopt paired exchange kidney transplant surgery was premised on the fact that a number of patients with kidney failure are unable to undergo surgery because they do not have compatible donors. Moreover, the paired exchange notion is one which sees kidney failure patients exchanging donors, once they are found to be a suitable match, in order to increase the chance of compatibility. This approach is one that has been adopted in a number of developed countries, since it has been found that although the relatives of some patients are willing to donate a kidney to their loved ones, they are sometimes found to be incompatible. Although Budhoo’s wife, Kumarie, was found to be a suitable donor, a number of Narine’s family members, including his brother Ghansham, were found to be incompatible and therefore could not donate to him [Narine]. However, a cross donation move [the paired exchange] saw the patients exchanging their donors. “It was fortunate that they were both compatible,” said Dr. Persaud. According to Director of Medical and Professional Services, Dr. Sheik Amir, who shared the spotlight with Dr. Persaud yesterday, the paired exchange programme is one that serves to emphasise the fact that patients can benefit from donors outside of their family. “Maybe I wanted to donate to my family, but we are not compatible, and then you think that all hope is lost, but no, families can cross donate,” Dr. Amir assured. In fact he revealed yesterday that at the Kidney Failure department of the hospital “they have a database and they have all [the names of] patients who are eligible for transplant and will be able to identify who can have a donor. This is in light of the fact, he added, that not all patients who develop kidney failure are eligible for transplant surgery. However, for those who are eligible, once a potential donor is incompatible, this by extension means that the patient will have to remain on dialysis. Dialysis is the process of removing excess water, solutes, and toxins from the blood in those whose kidneys have lost the ability to perform in a normal way. Death for a patient on dialysis could be within three years after they commence dialysis, according to the Kidney Transplant Surgeon. In fact, he revealed that some patients have been known to die within the first year of dialysis which he informed is also a very costly process. Currently, there are over 100 patients on dialysis. While patients are afforded initial free sessions of dialysis at the GPHC, they are subsequently required to seek this service at private institutions. At the private institutions, a single session of dialysis could cost at least $15,000. Moreover, since patients are able to receive kidney transplant surgery free of cost, save the cost for the cross-matching test, Dr. Persaud said that those eligible for transplant are encouraged to take advantage of the service instead of remaining on dialysis. “A patient coming for dialysis has to make time to come, they spend time at the hospital and that is like two times a week. Generally, these patients are not productive but if you get your transplant you don’t have the burden of dialysis anymore…so there are lots of advantages, all things being equal,” added Dr. Amir. Even as he too highlighted the advantages of kidney transplant, Dr. Persaud said that the life expectancy after surgery could amount to 15 years and patients can undergo a further transplant if it is required. “The longest transplant I know a person had, it was for 40 years. So it depends on how you take care of it; you can attain approximately 12 to 15 years from a [single] transplant and even more, so that is a good aspect of it,” said Dr. Persaud. “They know they are hypertensive [but] they don’t take their medication. If they don’t change their lifestyle, diet and things like that, they will end up with the complications of these diseases,” underscored Dr. Persaud. Another bout of paired transplant surgeries has been planned and these, Dr. Persaud said, will be in addition to the regular transplant surgeries that the hospital has been conducting.